The last time I was in Orchestra Hall in Minneapolis was in March 2012 to see the premiere of Judd Greenstein’s Acadia. This is a work for full and fabulous symphony orchestra, and it explores a narrative of change, loss, and redemption. I left the hall that night happy – and completely oblivious to the fact that I’d be living those themes for the next two years. Eight weeks after that concert, the Minnesota Orchestral Association (MOA) quietly fired the first shot in its aggressive PR battle, months before the work stoppage they were planning for even began. This shot at audiences and donors was completely unprovoked and completely indefensible. Presumably assuming that the wider world would never discover their dirty underhanded trick, somebody at the MOA authorized the purchase of a variety of domain names based on variations of the phrase saveourminnesotaorchestra.com. Why? During the Detroit Symphony strike, audience advocates there had created headaches for the board and management by creating an organization named Save Our Symphony to protest the direction the DSO was going. And consequently, the power players at the MOA wanted to make it harder for any Minnesota-based upstarts to start a similar group. This paranoid purchase proves that they were afraid that Minnesota audiences might try to derail the plans they had to choke the organization and remake it in their own image. I can confirm that their fears were well-founded. But there was no time to reflect on any of that as I stepped for the very first time into the Rorschach test of a new lobby. (Do you see a brand new $50 million boondoggle symptomatic of a dysfunctional organizational culture that values bricks and mortar over world-class orchestral music-making, or a badly needed remodel that will strengthen the Orchestral Association in a myriad of ways and foster community engagement and goodwill? Your answer will remain confidential between you and your therapist!) I immediately was in the arms of a musician friend, tearing up on a tux shoulder. Screw reflection; we’ve been to hell and back and we survived, so let’s celebrate. His words came out in a rushed tumble. We’re playing well, he said. Each week we’re sounding better. We need him back. Of course, “him” is Osmo Vänskä: the beloved Finnish music director who brought the already great Minnesota Orchestra to even greater heights during his ten year tenure. He’d resigned during the sixteen-month-long lockout, and it is obvious he won’t bother to return unless and until the MOA board of directors demonstrates a renewed commitment to world-class orchestral music-making…a goal they, to be blunt, didn’t show any commitment to in 2012 or 2013. (Thankfully, 2014 is going a little better. So far.) What exactly that commitment might consist of, and what their terms might be, I don’t know, and of course it’s none of my business to know. But now that the lockout is over, there are at least some board members who want Osmo back. They’ve taken the first step to getting him back by overseeing the…completely voluntary resignation of the orchestra’s controversial CEO, Michael Henson. Osmo and the Orchestral Association are now in negotiations to see if they share enough of the same goals to make his return worthwhile. If the stars align, part two of our beloved Osmo’s tenure could be on its way. Plus, so many audience members are relieved to see the architect of the lockout packing his bags. Hence the electric buzz in the lobby. Save Our Symphony Minnesota, the audience advocacy group the Minnesota Orchestral Association had so feared before the founders of SOSMN even knew they were going to found SOSMN, recently issued a call online to encourage people to dress up in blue and white and to wave Finnish flags at Osmo’s Sibelius concerts. This effort was labeled the “Finnish It” campaign. (We like puns.) 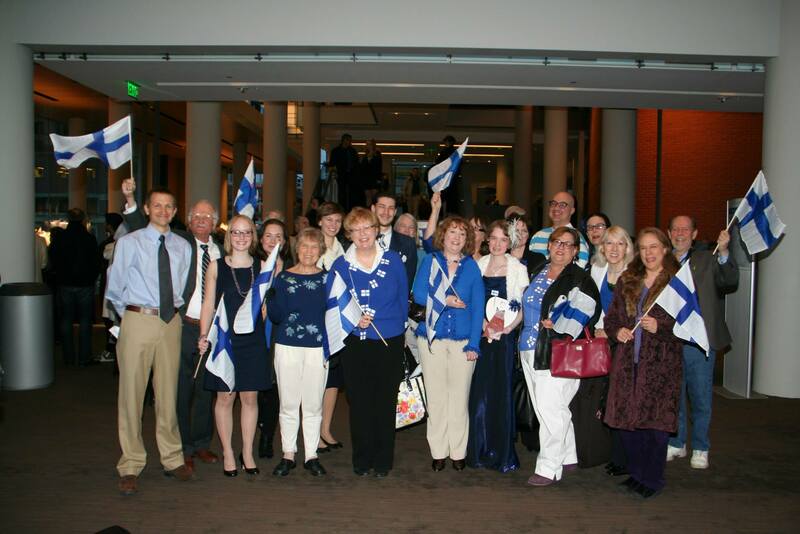 SOSMN’s devoted mob of 10,000+ supporters immediately bought up all the Finnish paraphernalia in the Twin Cities metro area. Seriously. I am not joking about this. If it was related to Finland and could be waved or worn, it was out of stock. Even the grand dame of the orchestra, the divine Mrs. Judy Dayton, patron saint of the orchestra, was photographed pointedly waving a Finnish flag. When I took my seat, wearing a long blue dress and a big white hairpiece, Finnish flag in hand, I felt like a die-hard sports fan who had made a wrong turn somewhere. I looked around at my fellow concertgoers. There was a sedate elderly couple to my right, sitting near the seat Mr. Henson has traditionally occupied post-lockout. I automatically stereotyped: old, probably uptight, anti-musician… Then, happily, my horrible awful stereotyping was shattered mid-judgment as she reached into her purse and withdrew a full-size Finnish flag. I grinned and applauded as they draped it from the balcony. The patron revolution is complete: the audience has literally planted their flag in Orchestra Hall. Somewhere in all this excitement, the leaders of the MOA were sucked into a black hole…or so one assumes. CEO Michael Henson was on…vacation. (Details of their working relationships haven’t been made public, but the few that have make it clear there is no love lost between Mr. Henson and the Maestro.) No representative from the MOA’s management or board spoke from the stage to congratulate the Maestro or his Musicians on their Grammy win for their recording of Sibelius one and four. The Grammy win was ostensibly the whole reason for the concert, so….that was weird. There wasn’t even an employee in charge of ordering flowers for the stage. The lockout may be over, but clearly the profound institutional dysfunction that spawned it is not. So on Friday SOSMN promptly delivered a massive blue and white bouquet to the stage door. As the leadership of the MOA flails about, desperately trying to chart a direction in the aftermath of disaster, the audience is stepping in to direct the resulting cacophony. If we see the MOA is unable or unwilling to follow through with a good idea, we just step in and take care of it ourselves. The results are both amusing…and amazing. The energy pre-concert was uproarious. I’ve never experienced anything like it. It was just as intense as Bon Iver’s homecoming show, and that was a performance designed for college-aged indie rock fans. And that was all the spark the gasoline-soaked tinder needed. The audience whooped and hollered and began to clap in anticipatory synchronicity at the still-empty stage. It’s a good thing there are no chandeliers hanging from the ceiling because I think otherwise we would have been hanging from them. Have you ever felt the force of 2100 people in a communal synchronized clap in a hall built for acoustic performance? The force of each clap comes close to knocking you off your feet. A few musicians told me later that when they heard the ruckus backstage, they checked the time and were surprised to see that there were still quite a few minutes to start time. They weren’t sure we could keep the applause going that long. But of course we could. We’ve been metaphorically applauding these musicians for two long years. I think we can handle ten minutes of literal clapping. You can imagine the tsunami of sound when the stage doors finally opened and musicians came pouring out, united, in the European fashion. Vindication. Total, absolute, no-holds-barred vindication. I have never seen a concert hall lit by so many joyful faces. This was the moment that Minnesota music lovers have been fighting for day and night for almost two years. A stage full of our virtuosos, facing a new day with new leadership, bruised and battered maybe, but still the greatest symphony orchestra in the world. And they were about to prove it. The celebratory mood dissolved abruptly as soon as Osmo raised his baton to lead his orchestra in Sibelius 4. The audience settled into its seats and the tone shifted from that of a raucous sporting event to something more akin to a religious service. Beloved long-time principal cello Tony Ross – who has been offered the principal position at the Chicago Lyric Opera, and may well leave Minnesota to take that job – played several yearning solos, indescribable in their maturity and beauty. The many layers of meaning there were just as pungent as you’d imagine them to be. The enigmatic sounds from the stage were wondrous: a wide view of the clouds and the cosmos. Are they sad sounds, or are they just so beautiful they make you sad…? In the first movement, the violins ascended into the stratosphere, a passage that could easily turn into intonation hell, transformed into ethereal heaven. During the lockout, I think many of us had one specific moment that was worse than all the rest. One moment where all the hopelessness of the situation came to a head. My dark night came in icy January. I don’t need to say what triggered it; that is private, and irrelevant to anyone but me. But suffice it to say, in this blackest night of the lockout, I wept. I cried. I sought my catharsis through tears. When you grapple with emotions this dark, and fail to come to terms with them, eventually the paralyzing realization strikes: you must somehow learn to live trapped between the ribs with them. You find you are terrified of your own self – of your own potent, impotent, fury, despair, fear. As I fell asleep that night, I had a migraine from crying. Each horrible heartbeat pounded in my head. That heartbeat felt exactly like the end of the third movement of this symphony: a note, repeating again and again…sad half-thought phrases drifting all around it…ultimately dissolving into silence…sad unconsciousness. I wept again in the hall, remembering that dark night of the soul. Maybe this time there was a kind of catharsis to the tears. Sibelius’s fourth symphony raised many cosmic questions, but it didn’t really answer any of them. As the orchestra questioned, there were several moments in the fourth movement when the strings began quiet, quiet, anxious, anticipatory, electric churns. The sound was so distant it felt like it was coming from another world: like we were hearing it through some kind of magical gauze. Incredible as it may seem to someone who hasn’t yet witnessed the miracle in person, when there’s a pianissimo on the page, a human whisper is literally louder than the Minnesota Orchestra under Osmo Vänskä. Audience members exchanged awed, delighted expressions. I don’t know that I’ve ever been more fulfilled. There was so much, it was impossible to take in. At the very end of the symphony, the winds mentioned a few unremarkable phrases; the strings answered with commiserating murmurs; then there was — silence. The end of this symphony sounds like a sad woman at the end of a difficult day. She has her troubles, and she grapples with them, but she also sees that she has survived…for now. She will postpone her ultimate despair, her worry over an unknowable future. She will acknowledge the gift that is her present. Sibelius’s First Symphony is set in a completely different universe from the Fourth, and its operatic opening was the perfect bridge between the two. It was also a bridge symbolic of all we’ve lost. Burt Hara, our beloved superstar clarinetist, was driven away from Minnesota by the lockout and (more relevantly) the Orchestral Association’s profound institutional dysfunction. He has accepted a permanent position with the Los Angeles Philharmonic, and he will not be returning to Minnesota. His glaring absence in the big clarinet solo was a bittersweet moment in a night of celebration. But clarinetist Greg Williams stepped into those huge empty shoes, and he did so with grace, aplomb, and – yes – bravery. It was a brave thing to play as beautifully, as effortlessly, as he did Friday night. But – there are so many empty seats onstage. So many homes shattered, so many friends and families separated. The wounds are deep, and so very real. They will take time to heal. Let’s talk about these notes from the scherzo. On the Orchestra’s Grammy-winning recording, those notes are there, obviously, but they don’t really draw attention to themselves. But in a live performance, they assault you every single time they appear, dancing from one section of the orchestra to the next. Why, it almost sounded as if years of pent-up aggression was being let loose in seven notes (…one for each year, perhaps?). Bum bum bum bada bum bum! When will you hear an orchestra of this caliber play for its life like this? Never again, I hope. Never again. For the inevitable encore, Osmo and his musicians repeated the end of the First. You cannot imagine lusher, plusher, more luxuriant sounds. What could be more beautiful? What on the face of this earth is more beautiful? The correct answer to that: nothing. Nothing is more beautiful than the Minnesota Orchestra in full bloom! No matter the tribulations — our great Minnesota Orchestra will survive. The brass blared their final chords, and the promise was sealed. Wonderful, Emily! I can relate to so much of what you stated. I purposely did not listen to the cd prior to the concert, because I wanted to experience the music as if it were a gift that was unwrapped for me. It was thrilling to sit in the 2nd row directly behind Osmo Vanska. To watch his face as he led his musicians through this glorious music was special. I will treasure this concert for a long time to come. Through all the pain that the musicians endured because of the lockout, we continued to stand behind them. SOSMN is not going away any time soon. We love the MN Orchestra too much to believe that all the work is done. There is still much to do. I want to give credit to Jeffrey Richman, it was his voice that boomed out “Osmo Come Home!” Indeed, I would echo that wholeheartedly. We will never know what negotiations are taking place in the background between Osmo and the Board. But clearly, there are Board members who resent the relationship he has built with the musicians and the audience. Moreover, it appears there are many orchestra supporters who are prepared to roll up their sleeves and work to build the financial backing the organization needs for its long term survival. Is there another arts group that would not embrace this kind of extraordinary outpouring of public support, and use it to benefit their organization’s future? I think not, and it raises the question of why they hold this peculiar attitude. It’s as though they don’t want anyone else playing in the sandbox they have created for themselves. Once again the divine Miss Emily says it so very, very beautifully. The storm analogy is very apt one, I think? Down here near St. Louis we get our share of bad weather and if a soul is brave enough to venture out into a particularly bad storm, and endure it, they are invariably left with a lasting impression from it (duh, right!). The best part is the end, before the losses are tallied up but after the worst of the storm has passed. The angry violent winds die down. The blacks turn to greys. Then the greys fade back into colors, one by one. The calm comes and the waking whispered time begins. It is an easy moment to miss. In fact I’m almost convinced that a person has to experience the worst moments of a raging storm to begin to fully appreciate that moment, as life peaks, then bursts, back into in the quiescence of a soon passed rager – because it is a fleeting moment. Life tends to burst into the silence like a river breaking throuh a crack in a bursting dam. Godspeed to the Minn Orch and Osmo will be back. This post brought tears to my eyes. I only wish I could have been there to witness it all! My darkest moment of this lockout came when Michael Gast (principal horn) was granted his year long leave of absence… My thoughts were he was gone forever. It was at this point I suddenly lost my drive, my will to continue on as a musician….when those negative thoughts start pumping through your head as “what’s the point anymore…”. Your words bringing me to tears prove that there I clearly feel there is a point, and that point is to make people feel how everyone who attended this concert felt. To create community. To create hope. To create music. Thank you for sharing this with us all. Emily, your description of the concert has made palpable one side of the coin, that of the enduring need for humans to make and respond to “ART.” Its the reason this orchestra has been here for 110 years and the reason that, despite its need for subsidy, the symphony orchestra as a medium of musical thought continues its 400 year evolution. As long as the orchestra can deliver this emotional connection by playing great literature well, the public will want it to continue. The obverse is the subsidy any orchestra requires. Europe uses taxes, America uses charitable donation. As played out here, only those who have extraordinary financial means have access to the governance of MO. It seems obvious that the majority of the Board has become dominated by spread sheet readers who see the orchestra as a business to be “restructured” in the Wal-Mart model, the antithesis of what you have described so elegantly. While, perhaps, well intentioned in the beginning, their insistence on “sustainablilty” has blinded them to what is the real reason for the orchestra, to play great music well. We, as the caring classical music consuming public, must continue to pressure to board to hire Osmo and to accept the paradigm that it might actually be fun to collaborate with Osmo and the musicians to find musical solutions to the financial difficulties. If MOA asked the musicians to think up ways to increase ticket purchasing and find new audiences they would have a vital source of ideas and have the product–the musicians–fully invested in solving problems. If MOA asked the audience what works they would most like to hear and play some of them next year, the audience would feel respected and respond. If MOA asked the audiences for help that was specifically targeted to empowering the musical product–hiring Osmo and paying musicians–they would find support beyond their expectations. Last night we attended the opening of the recently renovated Northrup auditorium on the campus of the University of Minnesota. The celebration of this event was terrific. The enjoyment of the crowd was noisy and palpable. Yes, the lobby was a bit crowded, but who cared about that as long as everyone enjoyed themselves. The welcome was warm, even super-heated. President Kaler made it clear that this was a facility not just for the Board of Regents or theUniversity community and alumni, but for all the people of Minnesota. What a contrast with the “celebration” of the opening of Orchestra Hall, an elite, closed event enjoyed by the generous wealthy donors whose names were inscribed on the wall of the lobby. The rest of us, not just subscribers but the people of the state of Minnesota, remained locked out after the musicians came to terms. We still feel locked out, not welcomed to Orchestra Hall. Anyone not part of that distinguished company who were invited to attend the “opening” of Orchestra Hall last September was left standing outside in a “mild” protest that evening. Is there any wonder why the good old U, for all its faults, is popular with Minnesotans, while the MOA is not? Last night was a great show, a terrific, high-spirited return, a warm welcome for everyone from President Kaler, Vice President Hanson and greetings from the Governor. There was gratitude to those who made it all possible, including the state’s government, but in a way that stands in stark contrast with the contentious, embittered atmosphere with shouts to bring back Osmo that greeted the new president of the Board at the “welcome back” concerts in February and standing ovations in support of the musicians. Northrup is back in business, so is the SPCO with a very full and wonderful program of concerts for 1014-15. The Minnesota Orchestra is back in business–sort of–with a governing board that still cannot make up its mind on whether or not they want Vanska to return and thereby restore some trust to the music loving public of Minnesota. I think you put your finger on the main issue here. The behavior of the MOA Board is inexplicable and shameful. What wonderful disarmingly soul felt writing you give us. Truth has a convicting ring. I hope you can send this to MOA members, that they would reflect. I now live in Mexico, but if world class symphony music can be assured in MN, I could easily return, especially if OSMO does. Thanks for sharing. Thank you, Emily, for all the hard work, investigation, and wonderful writing you have done over the past year and a half. Your blog has been the first place I go for facts about the lockout and now the efforts to bring Osmo back. I think you’ve been the single most important voice in solving the lockout–a tremendous achievement. We should hold a parade in your honor once Osmo returns.